Jay Amburgey – OT – Reynoldsburg (OH) Reynoldsburg: Amburgey is a 6’5″, 280 lb. prospect with offers from mostly MAC schools, plus Cincinnati and Syracuse. He’s a 247 Sports 3-star, the #117 offensive tackle, and #1470 overall. He’s probably hoping for a Michigan offer, though Michigan’s recent offensive line commitments probably make that unlikely. 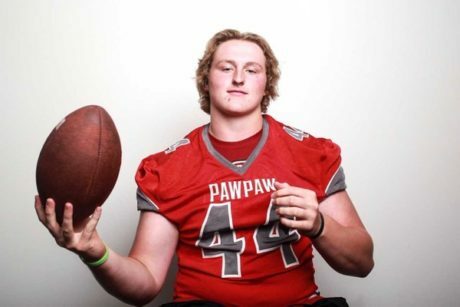 Karsen Barnhart – OG – Paw Paw (MI) Paw Paw: Barnhart is a 6’4″, 282 lb. prospect with offers from Indiana, Michigan, Michigan State, and Nebraska, among others. He’s a 3-star, the #45 offensive tackle, and #431 overall. 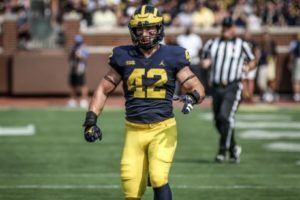 Barnhart is scheduled to announce a commitment later this week, and considering that he has scheduled a return visit to Michigan after his commitment, that choice seems fairly obviously (unless the Jack Stewart commitment changes things). UPDATE: It appears the Stewart commitment has changed things, and Barnhart is pushing back his commitment. 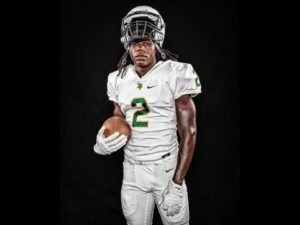 Devin Boddie – CB – Memphis (TN) Whitehaven: Boddie is a 5’11”, 165-pounder with offers from Georgia Tech, Louisville, Vanderbilt, and Virginia, among others. He’s a 3-star, the #56 athlete, and #615 overall. Hit the jump for several more visitors from the 2019, 2020, and 2021 classes. Zach Carpenter – OG – Cincinnati (OH) Moeller: Carpenter is a 6’5″, 310 lb. prospect with offers from Arkansas, Michigan, and Oregon, among others. He’s a 3-star, the #18 offensive guard, and #468 overall. 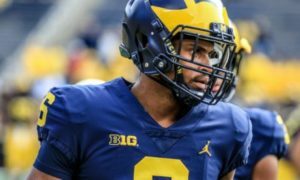 He visited Michigan last week and was offered on the trip, and this is a return visit. 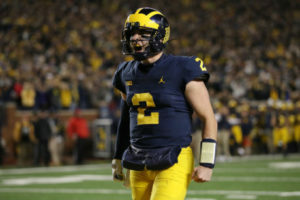 He immediately put Michigan in his top three after the offer. Demeatric Crenshaw – QB – Pickerington (OH) Central: Crenshaw is a 6’2″, 205-pounder with offers from Cincinnati, Indiana, Kentucky, and Louisville, among others. He’s a 247 Sports 3-star, the #7 dual-threat quarterback, and #321 overall. 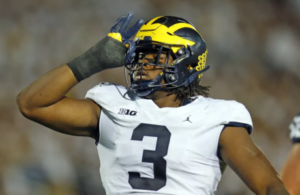 He attends the alma mater of former Michigan defensive end Taco Charlton. 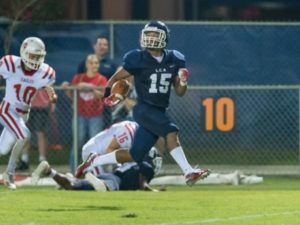 Aman Greenwood – S – Washington (DC) St. John’s: Greenwood is a 6’0″, 180 lb. prospect with offers from Boston College, Michigan, and North Carolina, among others. He’s a 3-star, the #79 cornerback, and #839 overall. Bryce Kirtz – WR – Brownsburg (OH) Brownsburg: Kirtz is a 6’0″, 180 lb. prospect with offers from Duke, Iowa, Kentucky, Northwestern, and Purdue, among others. He’s a 3-star, the #64 wide receiver, and #487 overall. 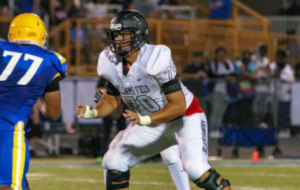 Andrew Kristofic – OT – Gibsonia (PA) Pine-Richland: Kristofic is a 6’6″, 265 lb. 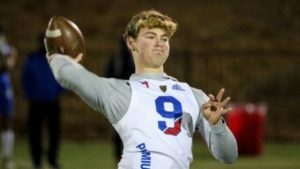 prospect with offers from Clemson, Florida, Georgia, Michigan, Mississippi State, Notre Dame, Ohio State, and Wisconsin, among others. 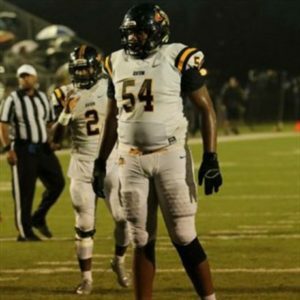 He’s a 3-star, the #49 offensive tackle, and #521 overall. 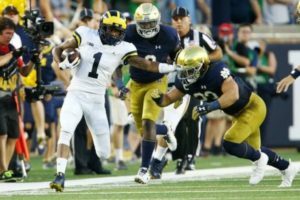 Right now all 10 Crystal Ball predictions are for Notre Dame. Gabe Newburg – DE – Clayton (OH) Northmont: Newburg committed to Michigan (LINK). 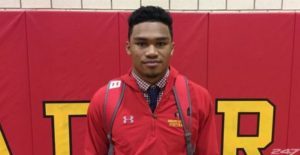 Taisun Phommacanh – QB – Bridgeport (CT) Avon Old Farms: Phommachanh committed to Clemson over this past weekend, so he probably won’t be following through with this planned visit. But I haven’t heard that he canceled it for sure, either. Anyway, Phommachanh is a a 4-star, the #3 dual-threat QB, and #114 overall with offers from Florida State, LSU, Michigan, and others. 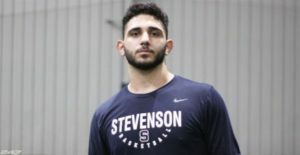 As a junior in 2017, he threw 25 touchdowns and just 1 interception. UPDATE: Phoammachanh has canceled his visit plans. D.J. 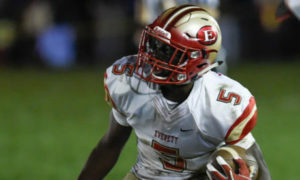 Turner II – CB – Suwannee (GA) North Gwinnett: Turner is a 5’11”, 170-pounder who has offers from Alabama, Clemson, Florida State, Georgia, Michigan, and Oklahoma, among others. He’s a 4-star, the #27 cornerback, and #283 overall. He has zero Crystal Ball picks right now, so nobody has an idea where he’s going. Joey Velazquez – LB – Columbus (OH) St. Francis DeSales: Velazquez is a 6’1″, 205 lb. prospect who is committed to Ohio State for baseball. 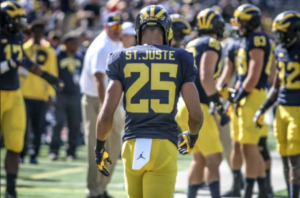 Michigan has offered him in both football and baseball. Kyren Williams – RB – St. Louis (MO) St. John Vianney: Williams stands 5’10” and 200 lbs. with offers from Kentucky, Michigan, Notre Dame, and Stanford, among others. He’s a 3-star, the #28 running back, and #421 overall. 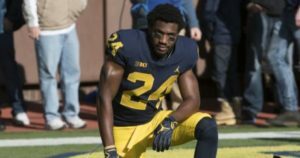 Williams could play running back or slot at the next level. Right now he has 4 picks for Notre Dame and 1 for Stanford. Max Wynn – LB – Dayton (OH) Centerville: Wynn is a 6’2″, 210 lb. prospect with offers from Cincinnati and several MAC schools. He’s a 247 Sports 3-star, the #34 inside linebacker, and #948 overall. Braiden McGregor – DE – Port Huron (MI) Northern: McGregor is a 6’5″, 225 lb. prospect with offers from Notre Dame, Purdue, and some MAC schools. He’s a 247 Sports 3-star, the #11 strongside end, and #262 overall. He claims a 235 lb. bench, a 315 lb. squat, and a 31″ vertical. 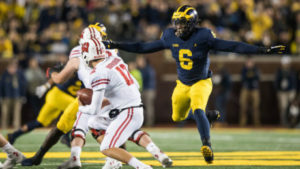 As a sophomore in 2017, he made 98 tackles, 17 tackles for loss, 1 sack, 1 interception, 3 forced fumbles, 3 fumble recoveries, and 3 blocked punts. 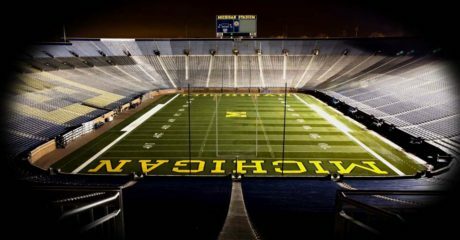 I’m guessing Michigan will probably offer soon, either as a defensive end or tight end. Rylie Mills – DE – Lake Forest (IL) Lake Forest: Mills is a 6’5″, 255 lb. prospect with offers from Illinois, Michigan, Northwestern, and Notre Dame, among others. He’s a 247 Sports 4-star, the #10 strongside end, and #226 overall. Isaiah Ratcliff – LB – Ellenwood (GA) Cedar Grove: Ratcliff is a 6’1″, 205 lb. prospect with offers from Kentucky, Michigan, South Carolina, and Tennessee. 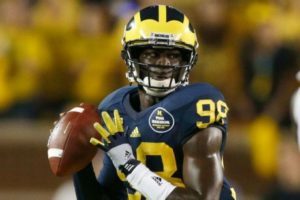 He attends the alma mater of former Michigan linebacker Elysee Mbem-Bosse. Chris Tyree – RB – Chester (VA) Thomas Dale: Tyree is a 5’9″, 175-pounder with offers from Georgia, Michigan, Penn State, and Virginia Tech, among others. He’s a 247 Sports 4-star, the #1 all-purpose back, and #31 overall. 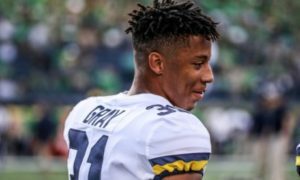 As a sophomore in 2017, he ran the ball 109 times for 1,113 yards and 10 touchdowns. Landon Tengwall – OT – Laurel (MD) St. Vincent Pallotti: Tengwall is a 6’6″, 312 lb. prospect with offers from Maryland, Miami, Michigan, Ohio State, and Penn State, among others. 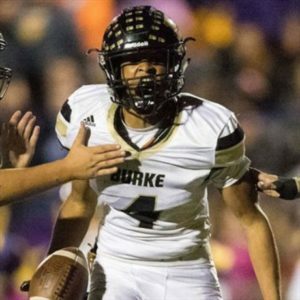 He picked up the offer from Michigan on his visit on Monday (April 16), which was on a Midwest swing through Columbus, Ann Arbor, and East Lansing.